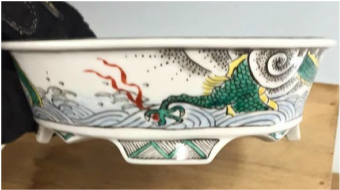 Ito Gekko is a superb potter and painter of pots, one of my favourite! 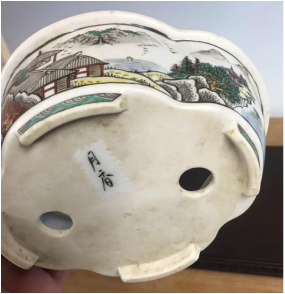 He was born in 1939. 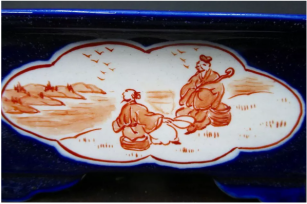 His parents; Ito Shiko, and Ito Tankyou, were respected potters, as is his brother Ito Tonyo. 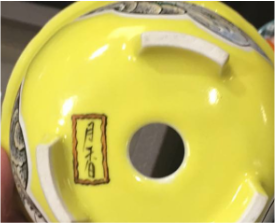 In 1959 he began painting sometsuke pots, which initially were mostly made by others; his brother, Itou Tonyo, local renowned potters, or his parents. 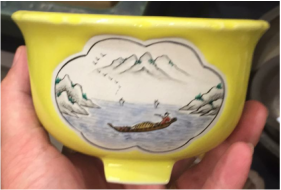 Since the 1980's however, he has also become a superb potter as well as painter. 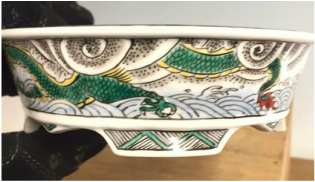 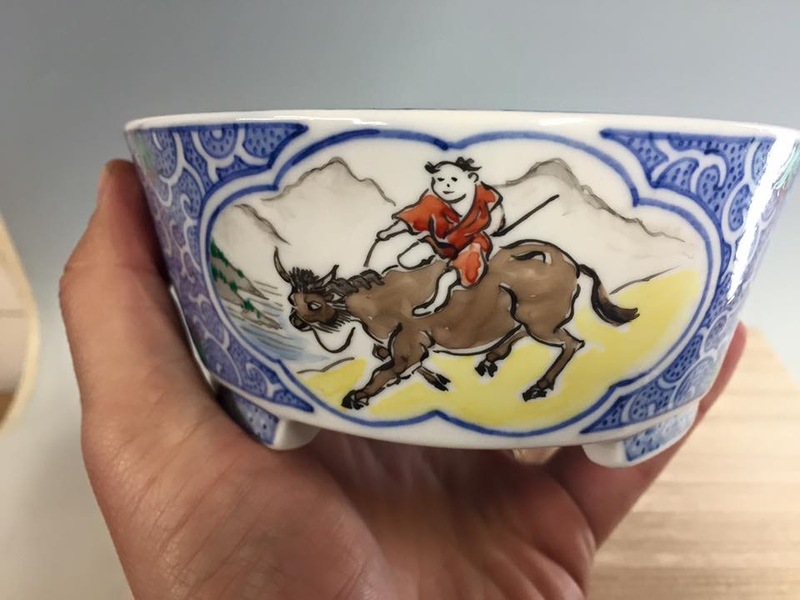 His paintings are all donr freehand, with no stencil use, as with some potters, and his works are influenced by the detailed paintings of the legendary Tsukinowa Yusen. 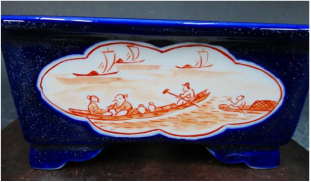 The techniques used by Gekko are varied, and include; sometsuke (cobalt blue on porcelain), akae (red on porcelain), overglaze enamels, and go-sai (5-colour) paintings. 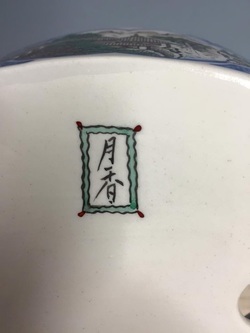 His seal reads 'moon incense'. 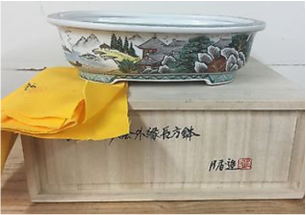 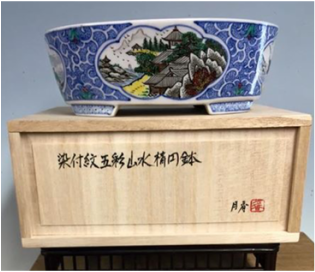 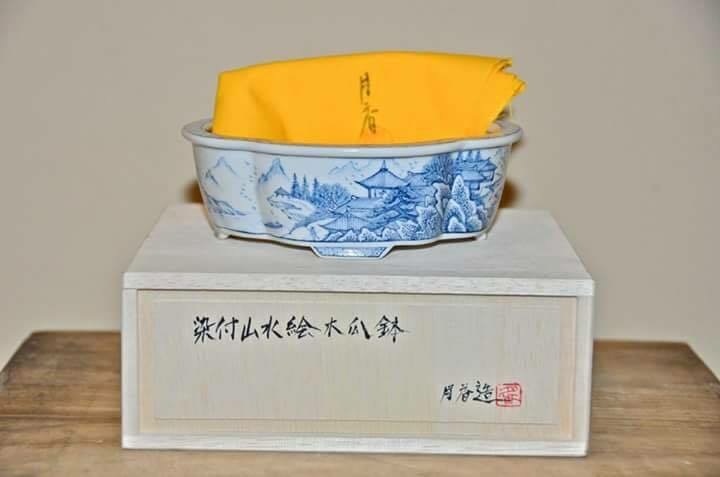 A small mokko go-sai (五歳 - 5 colour) pot with signed box and cloth. 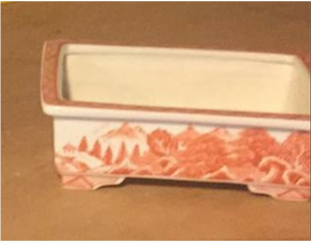 An aka (赤 - red) painted shohin rectangle. 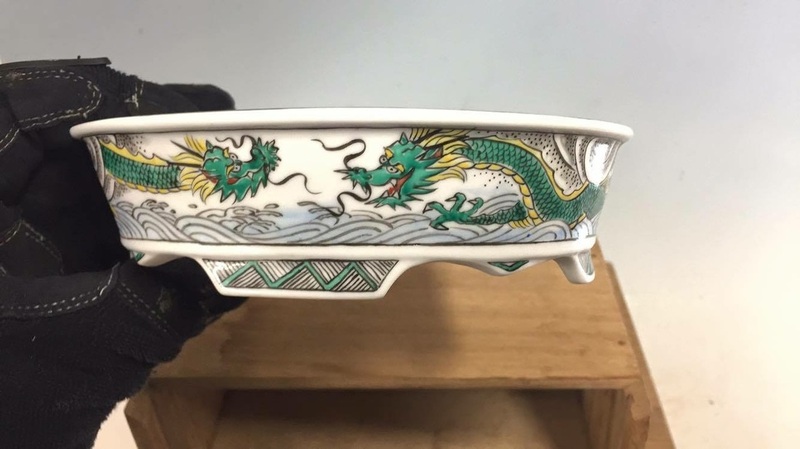 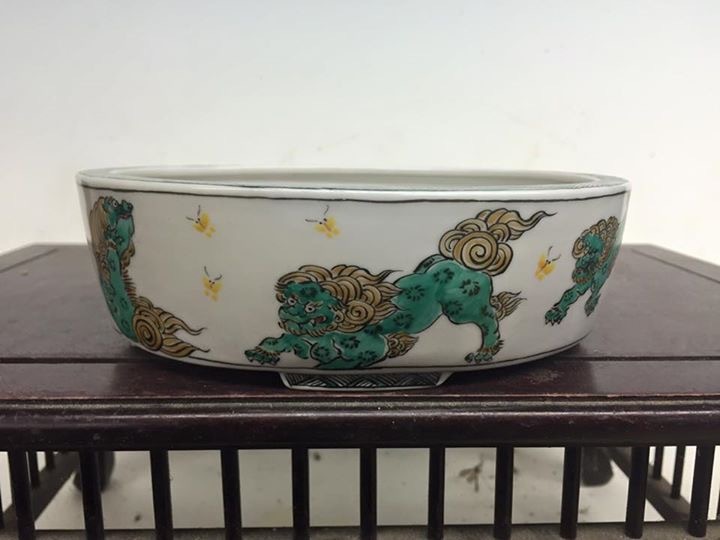 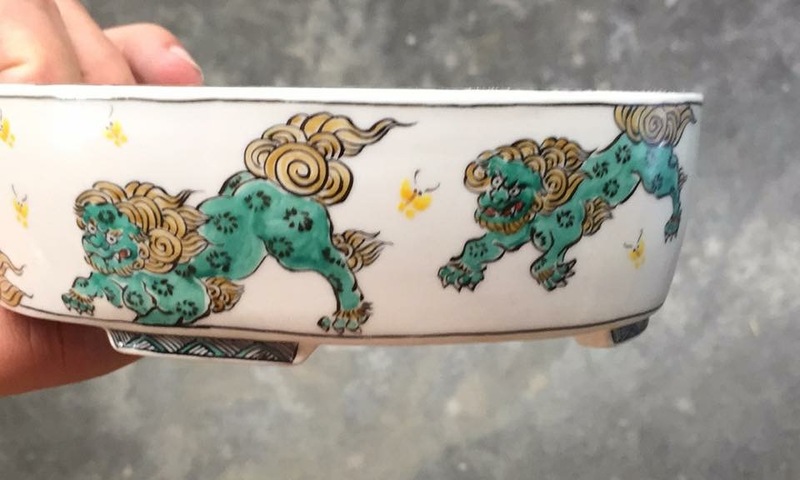 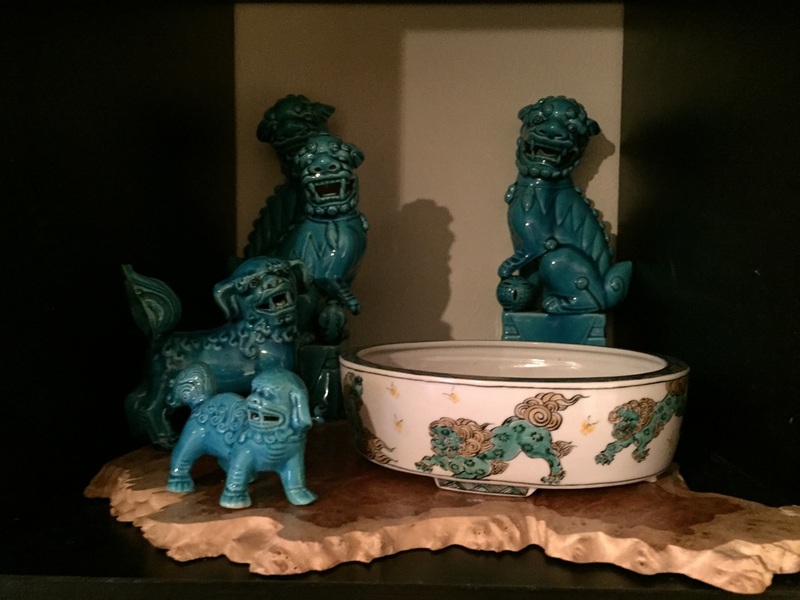 A go-sai oval shohin pot with Fu-dog paintings. 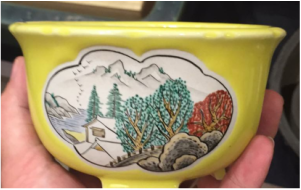 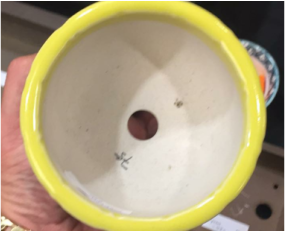 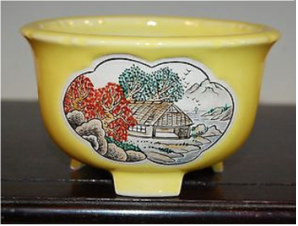 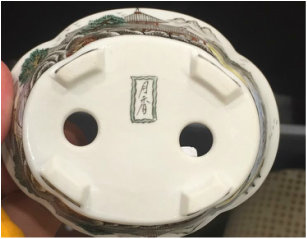 A superb yellow bowl with mokko shaped windows, framing sansui (山水 - mountain + water = mountain landscape) paintings in go-sai. 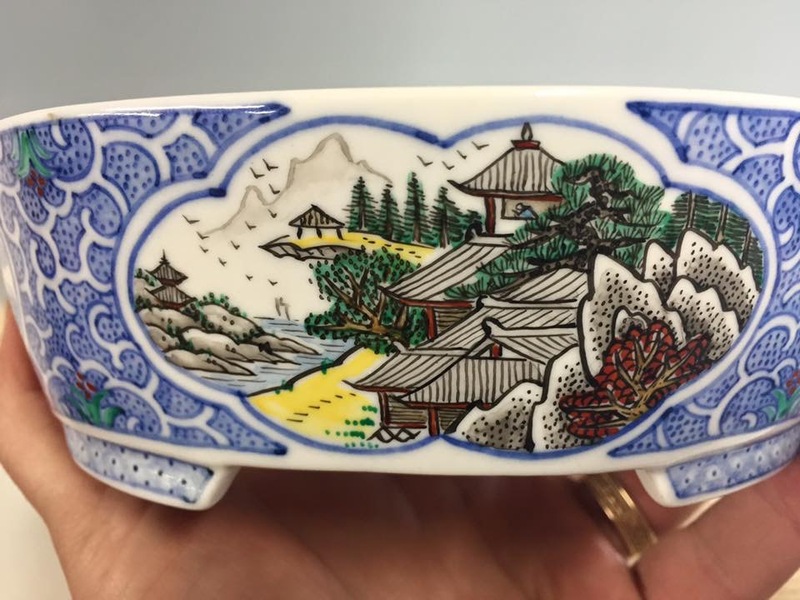 Larger size shohin go-sai painted oval, with signed cloth and box. 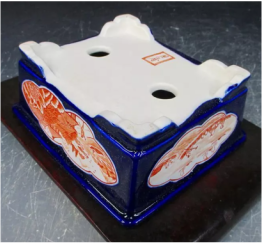 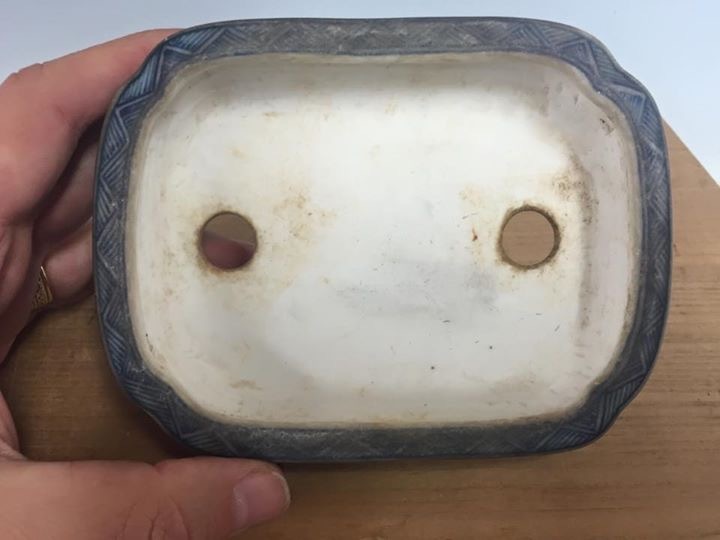 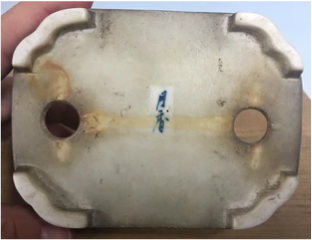 A stunning older sometsuke (染付 - cobalt blue on white) rectangle, with cut corners and patina. 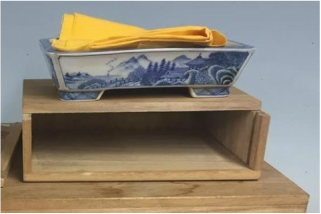 A larger vintage sometsuke rectangle with signed box and cloth. 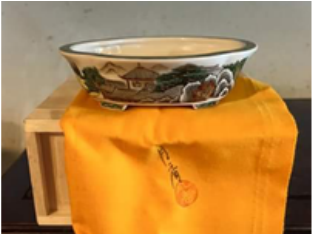 A larger sized shohin mokko with sometsuke boarder patterns around windows of go-sai sansui paintings. 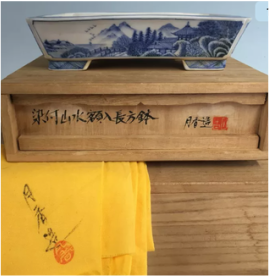 With signed box. 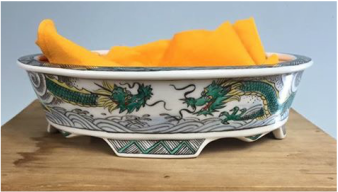 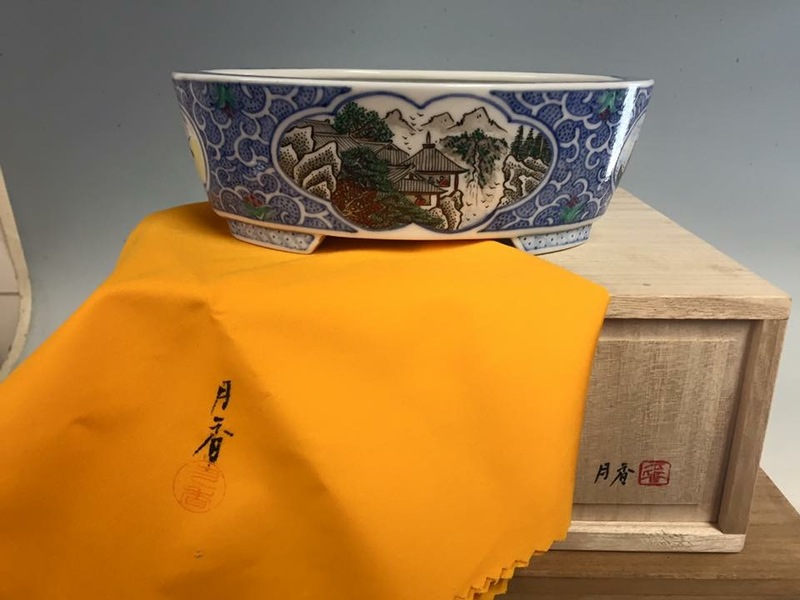 A stunning mokko sometsuke with signed cloth and box. 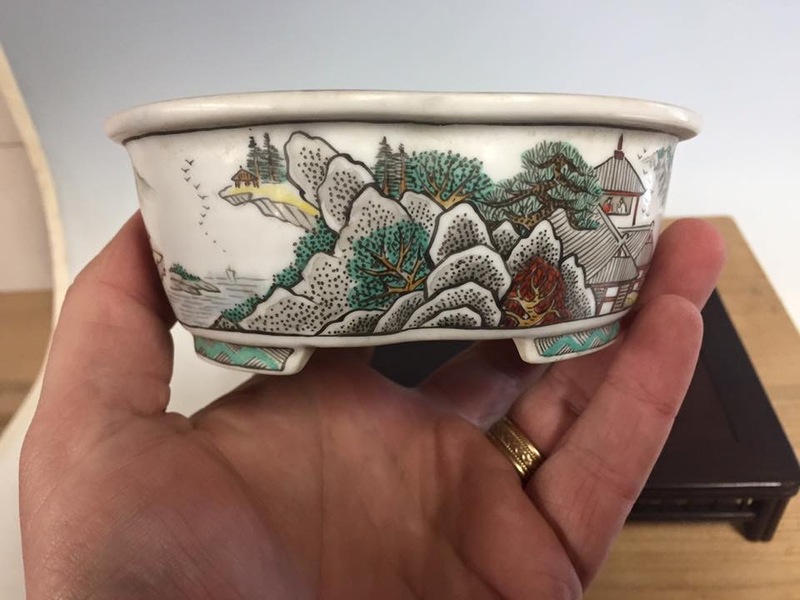 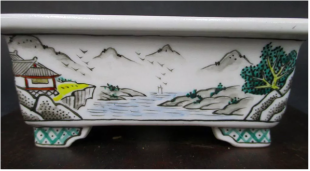 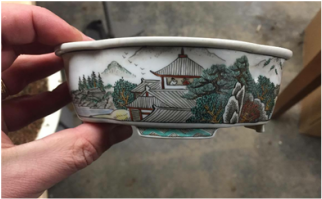 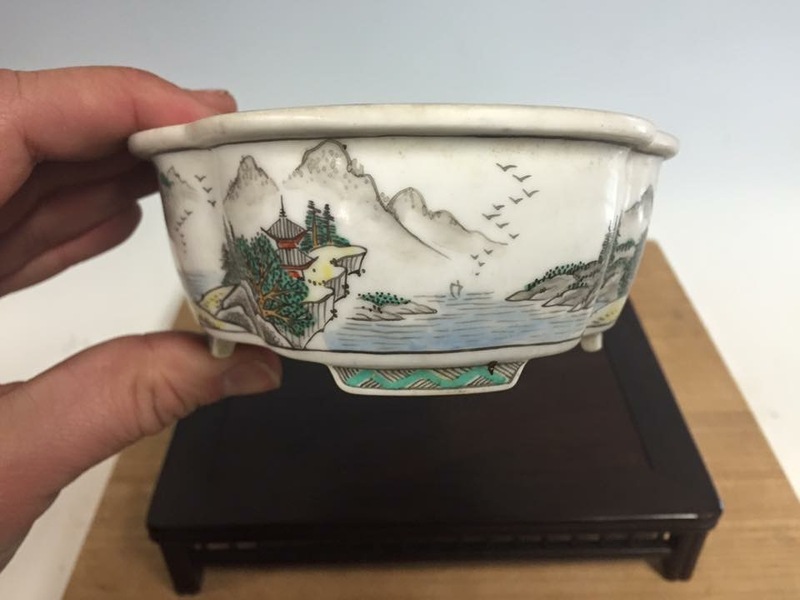 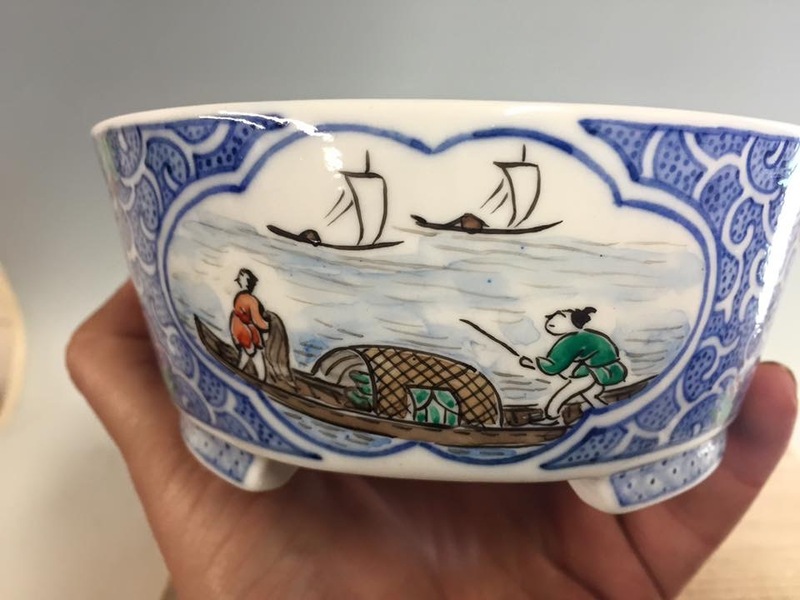 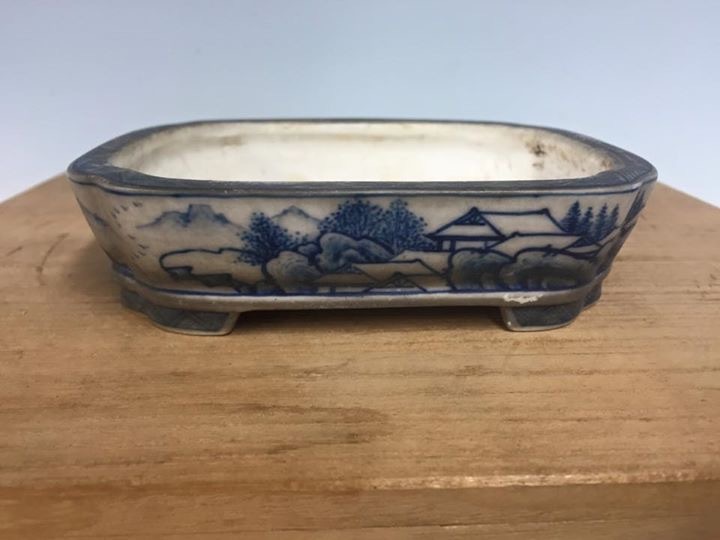 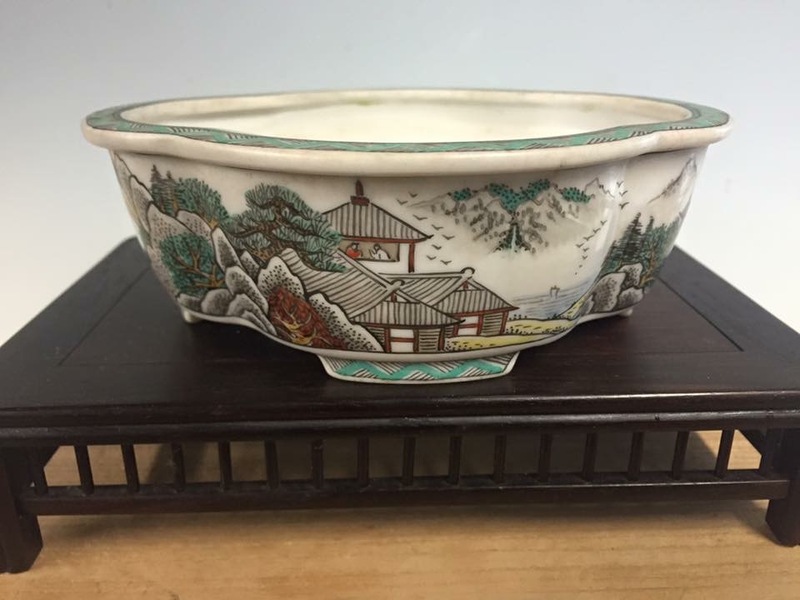 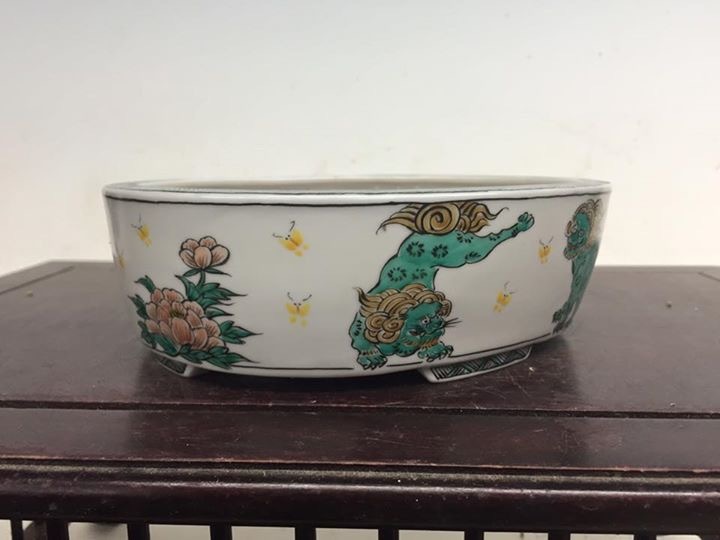 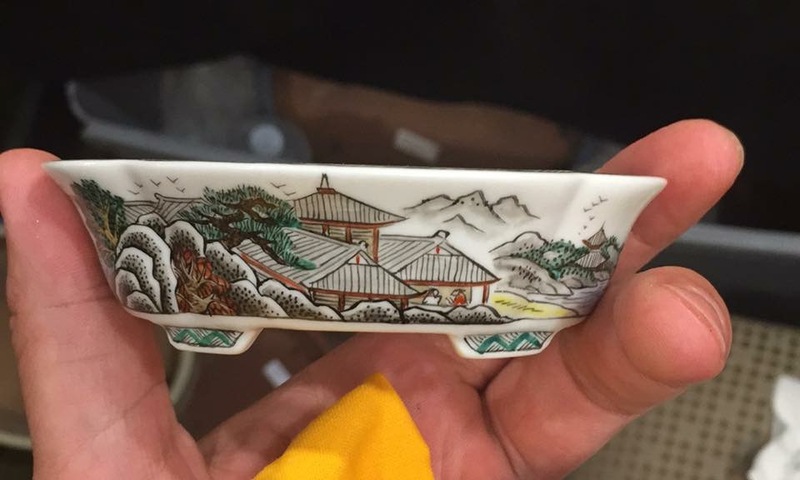 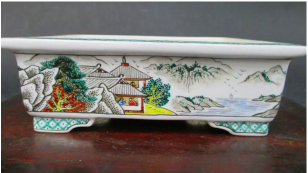 A superb mokko go-sai with beautiful sansui scenes, foot and rim detail. 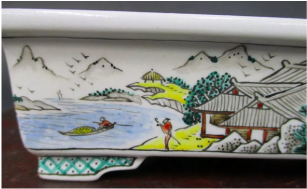 A beautiful go-sai rectangle with sansui scenes and painted foot and rim details. 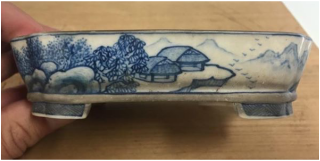 A stunning blue rectangle with block cut feet, and mooko shaped windows of aka painting of various scenes. 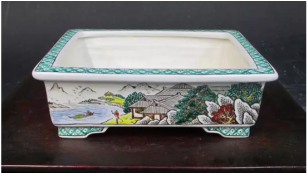 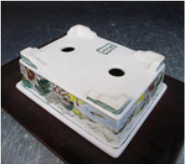 A stunning go sai rectangle with vibrant detailed paintaings, foot and rim detail. 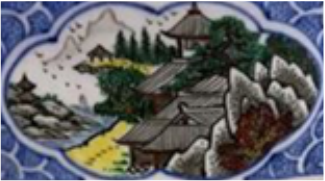 A deep shohin oval with sometsuke boarder pattern around go sai painted windows depicting land and sea scapes and a man riding an oxen. 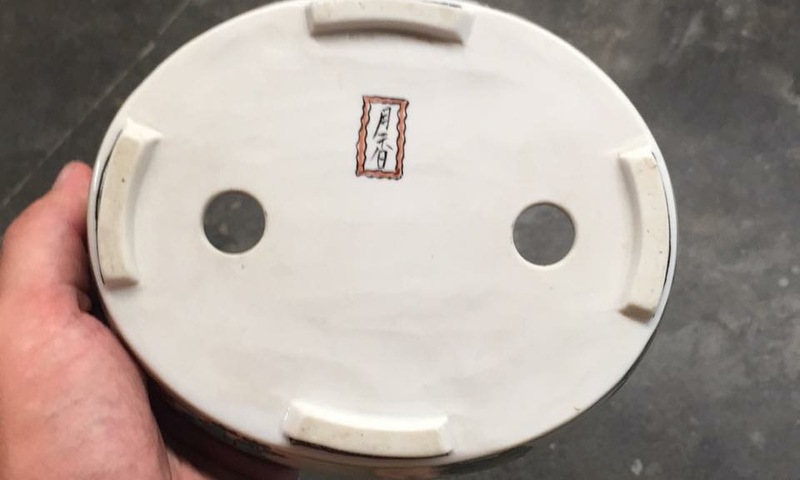 ​With very rare 'red dot' stamp.